It’s official…I am reliving my childhood. The boys and I went to the Arctic Cat dealer (Fuel Powersports) today to get some mix oil and a belt. They had the oil and needed to order the belt. I paid for the two items and headed for the door with my gallon jug of oil. Now mind you an Arctic Cat dealer is a very dangerous place to go. In addition to a giant selection of fine Cats they also have Yamaha and Polaris things with tracks, two wheels, and four wheels. Not wanting to be tempted I simply fixed my gaze on the door and plotted the fastest route to it. Then temptation crept in. On the way out, literally two feet from the door I noticed a super nice restored Honda Z50 that I had missed on the way in. It stopped me in my tracks. 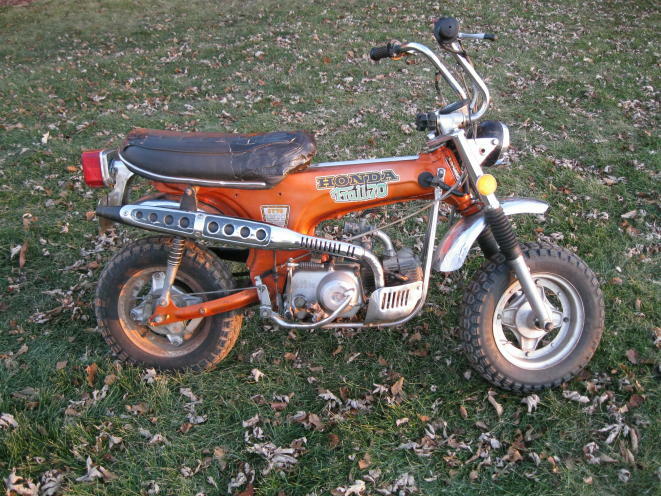 I have a soft spot for old Honda mini-bikes. I stopped to look at it and just for fun asked the sales guy what they wanted for it. $1500 was the response. Now it was a perfect example of a Z50 and worth something in the neighborhood of that amount on the open market. However it wasn’t the solution to any $1500 problems that I presently had so as we prepared to finish the process of walking out the door the sales guy said that he just took in three CT70s in case I was interested. How did he know that I’m always interested in CT70s? How did he know that I’m always even more interested in CT70s than Z50s? I figured that I’d play along a bit so I asked if they were parts machines. He said no. Ok. I asked if I could see them and this is where the trouble began. We made our way into the back of a warehouse attached to their storefront and there they were. Three early 70’s vintage CT70s. None of them were perfect but they were far from parts machines. We began to inspect them. One in particular was nearly complete, the most clean, had most all of its original parts, its frame and engine numbers matched, and it was my second favorite color: Candy Topaz Orange (Candy Gold being my favorite – and the most sought after color by CT70 nuts.) Visually it looked OK but it wouldn’t matter much if it wasn’t mechanically sound. I got on it and kicked it over. While it didn’t start at least it wasn’t tight and it had compression. That’s a good sign. I looked it over some more. The point of no return was rapidly approaching. I asked what he wanted for it. He shot back a price that was well below where I thought he’d be. Hmm. I looked it over some more. I really wanted to get it started but it just wouldn’t catch. It sounded very close but it just would not fire. I thought about it a wee bit. I asked the boys what they thought. They responded with “let’s go home and get the trailer.” They’re a lot of help to a man at a crossroads. But in the end that’s what we did. We now have a 1974 Honda CT70. It’s a three speed automatic in Candy Topaz Orange. We got it home this afternoon and despite the fact that it was very cold we putzed with it for a few minutes and got it to go. It runs fine on starting fluid. It sputters a bit without it. All good signs that at least there isn’t anything major wrong with the engine. While the machine needs a fair amount of work at least it’s not a parts machine. We’ll peck at it over the winter and see where we get. There’s an entire cottage industry of parts suppliers for these little bikes. You can even get a fair amount of new parts from Honda yet. 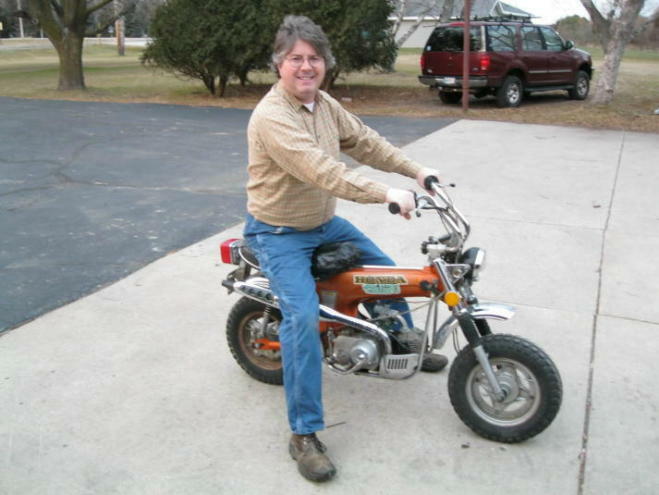 The CT70 was the bike that I learned to ride on many years ago. In the early ’70’s, when these bikes were new, my cousins had one. We didn’t see them very often but every Fourth of July we’d go to their house for a big family picnic. 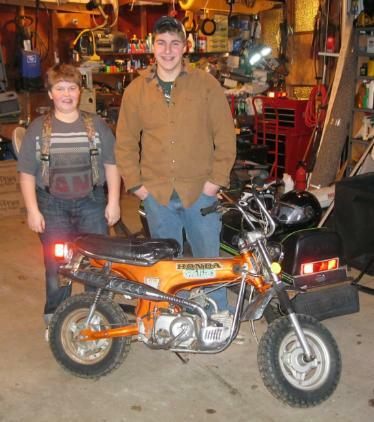 We would ride the snot out of the CT70 that they had. Riding that bike every summer was easily some of the most fun I had as a kid. It was a real highlight in those years of dealing with the limitations brought upon by my Arthritis. I couldn’t do much of the normal physical stuff that boys my age did but I sure could ride. I’ve wanted one of these bikes for a long long time. 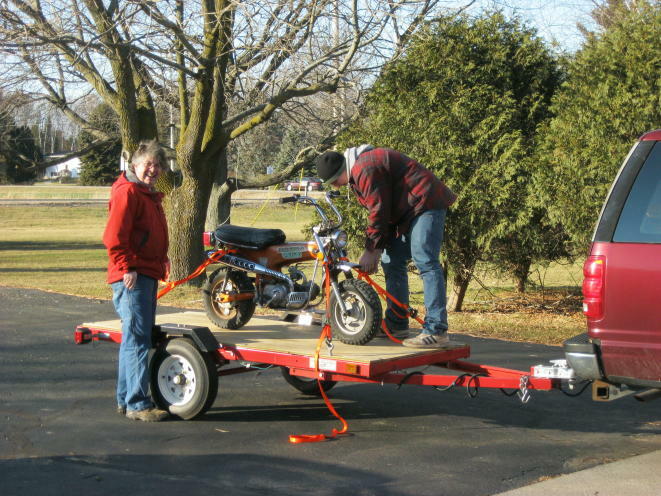 They aren’t that hard to find but they are usually either rough parts machines or well running machines that are pretty pricey for what they are and at the end of a day how badly does a grown man really need the small motorcycle of his youth? Well the one we got was right in the sweet spot of functionality for the price. While it will be a project it won’t likely be a total rebuild. It would be nice to do a total restoration and perhaps over time we’ll do that. I know that I need another project like I need a hole drilled in my head but I just couldn’t pass this one up. It will be yet another fun thing to work on with the boys. More on the CT70 is here.